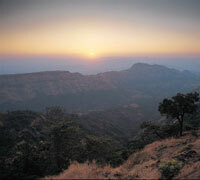 Asia’s only pedestrian hill retreat, Matheran, is a declared ecologically sensitive zone, perched atop the Sahyadri range. It was explored by Hugh Poyntz Malet, the British Collector of Thane District in 1850. Shortly after that the hill Station was established. Malet’s bungalow, The Byke, was followed by others - Barr Cottage, Walker’s bungalow and W. Fawcett’s The Hermitage. Soon after this many a bungalow sprang up. 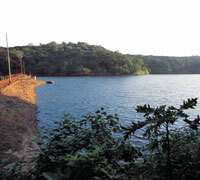 This lush green solitary woodland became a popular weekend getaway from the heat of Mumbai. This little hill station, meaning ‘mother forest’ or ‘wooded head’ retains its tranquility as all forms of motor vehicles are prohibited within the town. Matheran is covered with dense woods interspersed with stately bungalows built by the British, the Parsis and the Bohras. Overall the place evokes an old-world charm. The beautiful pathways, the cool air and the dramatic views from the vantage points, the scenic valleys below, and the occasional mist are its main attractions. In the rains the hills are topped by rain clouds - the incessant downpour, the swirling mist and the gurgling waterfalls look majestic. Adding to the experience is the journey by a quaint little train that chugs its way up the scenic ghat from Neral to Matheran. 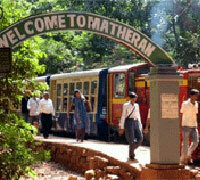 The Neral-Matheran narrow gauge hill track will celebrate its centenary in 2007 - the route opened on 15th April 1907. It was constructed by Mr. Abdul Hussein Adamjee Peerbhoy between 1901 and 1907. Four steam engines, which came from Orenstein & Koppel, were put on the line. After running on the route for 77 years these engines were replaced by diesel locomotives. The journey from Neral to Matheran takes two hours along a 22 kms long track composed of 281 curves. The hill railway runs parallel to the main Mumbai-Pune broad gauge and then turns to the west at Hardal Hill, following a sharp curve to the east. The ascent commences upto Jummapatti Station, for a brief halt of ten minutes. The journey continues past the steep slope of Bhekra Khud. The train moves further upward along dizzying curves, said to be among the sharpest on any railway in the world. 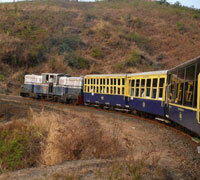 The train now runs along a curve - 60 feet in radius - below Mount Barry - and comes to the bottom of Matheran Hill. Folklore has it that this horseshoe-shaped embankment is a harbinger of bliss for the couples travelling on the train. The real ascent begins here. Minutes later the train runs through the popular "One Kiss Tunnel" that disappears in the blink of an eye and reaches Waterpipe Station. From here there is the sight of the River Ulhas and a miniature view of Neral town, which is a treat to behold. The further ascent beyond is through spectacular scenery, transporting one to another world. Now comes Aman Lodge Station, named after the adjacent bungalow, which was once owned by Abdul Hussein - the man who conceived this hill railway. From the time the railway started the train would halt and issue three whistles, as a mark of respect to the Peerbhoys, now, as a mark of tradition. The train moves on to finally pull into Matheran Station. There are hotels and guesthouses in Matheran which offer very comfortable accommodation, mostly with all modern amenities. Most of them are close to the railway station or to the market. The rates in general are high in season (Summer Holidays 10 April - 10 June, Diwali Holidays and Christmas holiday periods) and often include meals, but if you want to eat out, try one of the many joints around MG Road. Most hotels offer heavy off-season discounts. The normal check-out-time is 0900 hrs. It is always advisable to book in advance at the booking offices of the hotels in Mumbai and then to arrive, especially during weekends and in high season. Major credit cards are normally accepted at most of the high end hotels. 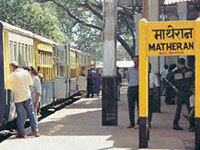 The facility of changing traveler’s cheque and forex is not available at Matheran, so better change your money before. Matheran is very easily connected with Mumbai & Pune by road & rail and has the most popular TOY TRAIN service between Neral and Matheran. Local trains to Karjat / Khapoli are easily available from Mumbai CST to Neral at regular intervals of about one hours. Also one can reach Matheran easily by road as it lies on the main Mumbai Pune Highway and takes around two and half (2 ½) hours maximum driving time to reach Dasturi car park, as it is known as the last road point. From Mumbai one can go to Vashi - Belapur - Kalamboli (enter Express highway to bypass Panvel City and exit after 8 km at Shedunge / Rasayani) take the NH4 highway till Chowk which is 12 - 14 km from the express way exit and then turn left onto the state highway for Neral via Karjat (take left for Neral). From Neral, the uphill to Dasturi Naka is about 8 km. After which one can either hire a hand pulled rickshaw or try a horseback for a change and for those who love to walk they can have a picturesque walk up to the main town as Matheran is known as a walkers delight. 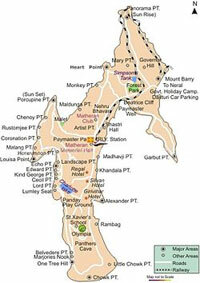 It takes around 45 minutes for one to reach our resort, Usha Ascot. Just 95 kms away from Mumbai and approx. 120 km from Pune, Matheran is one of the most popular hill stations in Maharashtra and the only place in ASIA which has a blanket ban on vehicular traffic. This rain forest surrounded with lush green valleys is about 2700 ft above sea level. This rustic hill station has USHA ASCOT, the finest 3 star resort of Matheran and is famous for its quality and comfort.